I create with specific intent, to enhance the living experience. Using artisanal handmade objects, helps remind us to slow down and enjoy the moment that resides in the chaos of day to day life. 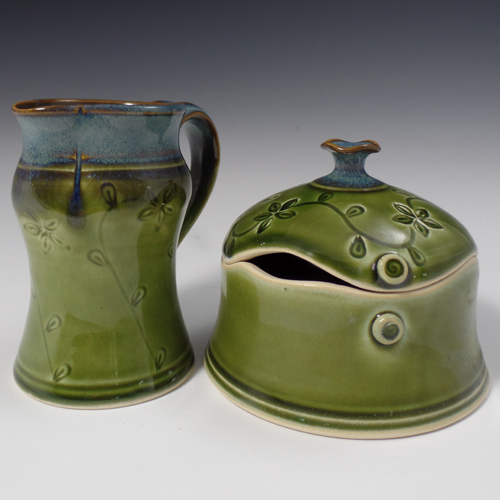 I offer a line of functional elegant pottery that is as beautiful to use as it is to look at. All items are dishwasher and microwave safe. Made with care in Asheville NC. Ask me how my cat Merlin is and receive $100 worth of free product with any order over $400.00 that is placed at American Handcrafted. Place your re-order at American Handcrafted and it ships free! Orders over $650 ship free and receive $50 worth of free product! 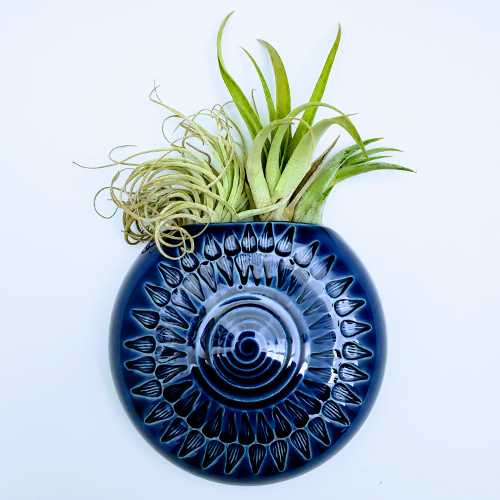 Air Planters are a new and popular item for 2019. They are approximately 3.5 to 4 inches in diameter and sho off the plants beautifully. They are decorated in a pattern of the artist's selectionand available in light blue, green or dark blue. There is a small hole in the back so they can hang on the wall. Succulent Wall Planters have been a best seller for 3 years running. 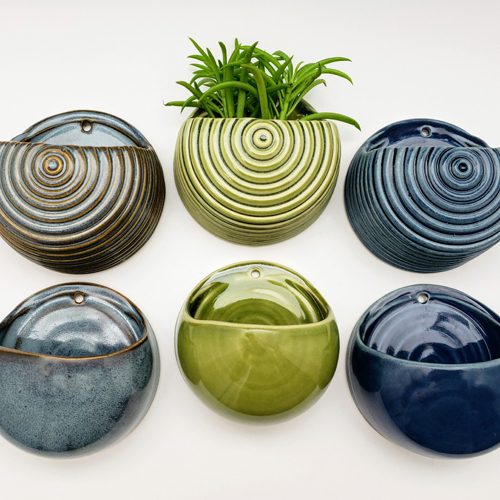 They are approximately 3.5 inches in diameter and are available in light blue, green or dark blue. There is a small hole on the back so they may be hung on the wall. 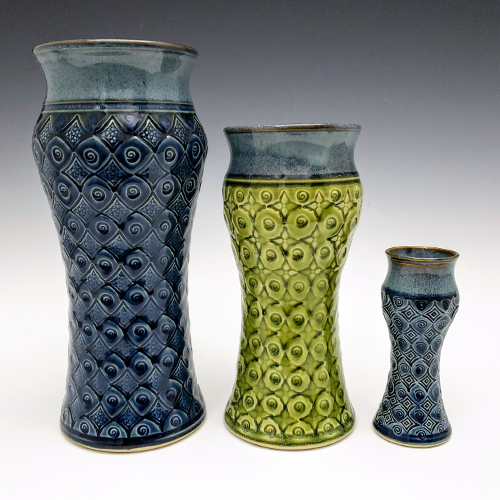 The Amphora Vase Collection ranges in size from 2.5 inches tall up to 7.5 inches tall. They are decorated in an assorted pattern of the artist's selection. The most popular size are the the 3.5 inch to 5.5 inch size. These mugs range in size from 8oz to 16oz and are dishwasher, microwave and freezer safe. They are decorated in an assorted pattern of the artist's selection and are available in either green or light blue. Q- Why does it matter if a mug freezer safe? A- That's a great question, because then you can enjoy a frosty mug with your cold beer! That makes it extra awesome. 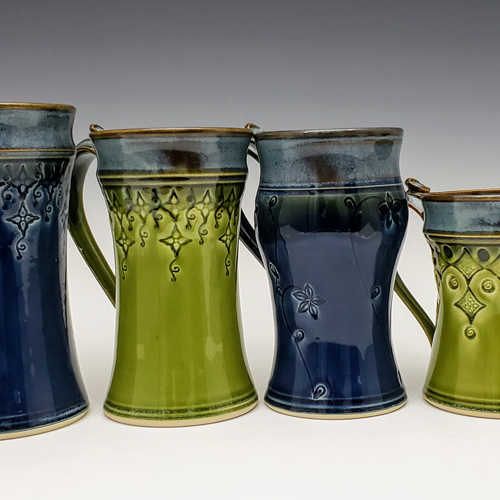 This set includes a 6oz pitcher and 1 cup surgar bowl. 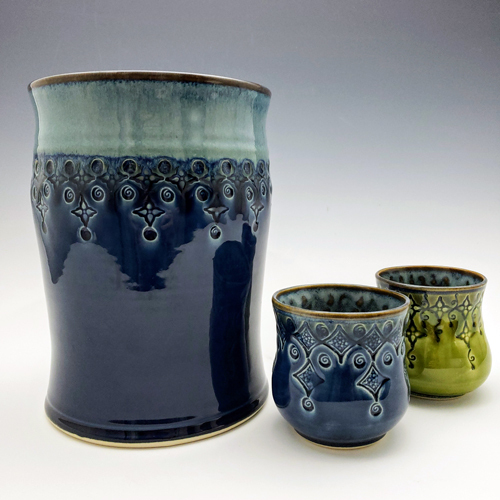 This set is decorated in an assorted pattern of the artist's selection. They are available in either green or dark blue.